Also seen as "John H. Latta". Born May 5, 1764 in Orange County, North Carolina. Died on Sept. 16, 1827 in Maury County, Tennessee. Lived in N.C. and moved from there to Alabama after 1821. He left all his connections in N.C. The family, with two sons and one daughter, went from Alabama, and then on to Henry Co., Tenn. by 1830 where all the children died except one son, William Scarlett. In N.C. a marriage license was granted to a John Latta and Sarah May on June 10, 1804 in Orange County,NC. A marriage license was granted to a John Latta and Sarah Scarlett on August 26, 1806 in Orange County,NC. She was the daughter of Stephen and Sarah Jackson Scarlett. (#4 Thomas Latta married Janey Scarlett, daughter of Stephen and Sarah Jackson Scarlett, and a sister to Sarah Scarlett. James Latta married Mary "Polly" Scarlett, daughter of Stephen and Sarah Jackson Scarlett) John Latta was bondsman for Thomas Latta and Elizabeth Hasting's wedding on October 25, 1791 in Orange County, NC, and also as bondsman for James Latta and Hannah Holloway's wedding on October 8, 1806 in Orange County, NC. John Spencer Carter, grandson of John Latta, writes: "I think that there were several of John's children who did not go to Tenn."
2 WILLIAM SCARLETT (2) b. Oct. 15, 1821 in NC. 3 STEPHEN (2) b. abt. 1816 in Orange Co., NC; d. in Tennessee. 13 CYNTHIA (2) m. Robert Carter. Four children: John Spencer. Sarah Jane. Mary Elizabeth. Susan Alice. In 1917 John Spencer Carter lived at Paris, Tenn. Route 6. John (1). b. October 15, 1821 in North Carolina (some resources say Alabama); d. in Clay County, Arkansas on December 16, 1911; buried in the New Hope Cemetery, Pollard, Clay County, Arkansas; m. Olive Bernetta "Nettie" Throgmorton (also seen as Permeta and Bennetta), daughter of James Throgmorton and Ellenor Pollard on June 18, 1833 in Henry Co., Tenn. Olive Bernetta Throgmorton was born on Aug 10, 1826 in Henry County, TN. She died on Aug 5, 1897 in Clay County, Arkansas. William and Permeta moved from Ala. to Jonesboro, Union Co., Ills. and lived there until 1854, then went to Ark. He was of Scotch descent on one side and Irish on the other. He helped to build the first bridge on the I.C.R.R. and the first depot in Ills. at Cairo. 14 JOHN HENRY (3) b. September 29, 1843 in Henry Co., Tenn. Died in the war in 1861 or 1862. 15 SUSAN SCARLETT (3) b. January 20, 1845 in Henry Co., Tenn.; m. Henry Bromlet. 4 JOSEPH JEROME (3) b. in Union Co., Ills. October 28, 1848; d. October 1933. 16 AMANDA ELLEN (3) b. December 28, 1851 in Union Co., Ills. ; m. Benjamin F. Ford in Clay Co., Ark. In 1935 she lived at Paragould, Ark. Two children, both born in Clay Co., Ark. and married in Green Co., Ark. : Annie b. November 11, 1880; m. John W. McWhirter October 6, 1902. James b. September 4, 1882; m. Isabell Robinson December 28, 1902. 17 MARY ELIZABETH (3) b. February 27, 1855 in Union Co., Ills. She died about 1875; m. James Napoleon Barnwell in 1874 in Chalk Bluff Township, Clay County, Ark. 5 WILLIAM JAMES (3) b. September 3, 1852 in TN; d. August 23, 1913. 6 THOMAS FRANKLIN (3) b. March 15, 1857 in Arkansas; d. December 5, 1923. 18 SARAH BENETA (3) b. in Green Co., Ark. in 1857; m. William J. Nicholas August 11, 1880. In 1916 lived in Clay Co., Ark. Five children: George W. b. August 6, 1881; m. Eva Pillow September 3, 1902. Lottie Ann b. February 2, 1884; m. Marshall Mooney October 12, 1902. Tenna May b. May 14, 1888; m. Richard L. Brady July 27, 1910. William Henry b. October 12, 1890; m. Julia Johnson October 28, 1909. Rose Belle b. August 20, 1893; m. Martin J. Gossett June 26, 1910. 19 MARTHA BELLE (3) b. July 26, 1860; m. George W. Parker. She died about 1900 in Clay Co., Ark. In the 1880 US Census, George W. Parker was living with the Latta family. 20 ANN ELIZA (3) b. November 7, 1863; m. J.C. Barnwell November 4, 1883. In 1916 lived in Clay Co., Ark. Children: Samuel Houston b. August 2, 1886. Maude May b. March 11, 1889; m. Charles Howard October 20, 1903. Samuel. 21 ELLEN JANE (3) b. September 16, 1869 in Union Co., Ills. Ella J. Latta married F. G. Thomas on December 13, 1887 in Craighead, Arkansas. LAWS - Spencer Laws was born in North Carolina in 1811. His wife, Mary, was born in Tennessee in the same year. In 1850 this family was living in Union County, Illinois and their children were: David, 1834; John, 1840; and James, 1846. All the children were born in Illinois. Mary Powell, born in North Carolina in 1788, was also a member of the household at this time. By 1860 the Laws family had moved to Greene County and settled in Bradshaw Township. James Laws, son of Spencer, was still living at home at this time. Vercilla Forrest, born in Tennessee in 1854, was also a member of the household. David Laws married a woman named Alpha, born in Kentucky in 1839. In 1860 David and Alpha were living next to David's parents in Bradshaw Township. Their children at this time were: H. E. (a daughter), 1856; and E. P. (a daughter), 1858. H.E. was born in Illinois and E.P. in Arkansas. It should be noted that, in 1850, the Laws family lived in the same neighborhood with the William S. Latta family in Union County, Illinois. The Latta family also moved to Bradshaw Township in Greene County during the 1850s. 2004 NOTE: Could Mary Laws be a sister to William S. Latta? She was born in TN and William's wife was born in TN. Was this where William met his wife? Notice from the census below that his wife's parents were also from NC. 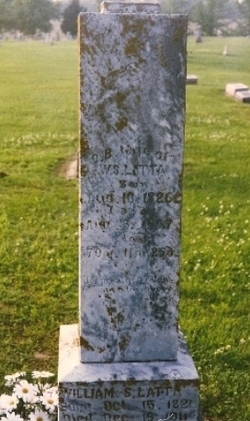 William S. Latta and wife Olive, and their son, J.J. and wife Mary A., are all on one stone. William S. (2) John (1). Born in Union Co., Ills. October 28, 1848; d. October 1933; m. twice: 1) Mary A. Alexander. 2) Mrs. Pernina Alexander Pillow. She was a sister to Mary. In 1916 living in Clay Co., Ark. Buried in the New Hope Cemetery beside his parents. They share the same tombstone as his parents. 23 FANNY BELLE (4) b. February 1, 1877; m. James M. Brown on August 15, 1897; d. March 29, 1903. 24 NEATY ANN (4) b. December 3, 1878; d. 1965; m. Thomas J. (J.T. on marriage license) Branson on March 24, 1897. Buried in the New Hope Cemetery. 25 ELIZABETH "Lizzie" EVELINE (4) b. September 23, 1880; d. 1964; m. Joshua Bare on December 26, 1897. 7 JOHN HENRY (4) b. December 27, 1882; d. April 24, 1958. 8 WILLIAM ALEXANDER (4) b. March 4, 1886; d. June 13, 1961. 9 CHARLES ROBERT (4) b. August 3, 1888; d. April 14, 1956. 26 JOSEPHINE MARY (also seen as Mary Jodie) (4) b. October 6, 1890 in Clay County, Arkansas; d. June 4, 1948; buried in the Piggott Cemetery, Clay County, Arkansas; m. Claud Ellison Williams on February 24, 1906 in Pollock, Clay County, Arkansas. She was 15 years old, and he was 19 years old. They had 11 children. 27 S.M. (4) b. November 7, 1898; d. in infancy. 28 JOSEPH EDWIN (4) b. October 29, 1900. 29 ALICE VERGIE "Vergie" (4) b. August 23, 1902; m. Guy Hays on September 2, 1916 in Clay Co., Arkansas. He was 21, and she was 18. 30 THOMAS WHITT (4) b. August 29, 1904; m. Della Glenn on April 14, 1940 in Clay Co., Arkansas. 31 NANCY BELLE "Belle" (4) b. March 9, 1905; m. John Austin Brady on December 24, 1913 in Clay County, Arkansas. She was 17, and he was 35. 32 JEFFERSON D. "Jeff" (4) b. December 9, 1907. 33 BENJAMIN FRANKLIN "Frank" (4) b. September 7, 1910 in Clay Co., Ark. ; d. Oct. 12, 1970 in Lincoln Park, Michigan (SS Index); m. Vina Faye Dennison on December 24, 1936 in Clay Co., Ark. 34 WILLIAM AMOS (4) b. June 3,1912. William S. (2) John (1). Born March 15, 1857 in Green County, Arkansas; d. December 5, 1923 in Clay County, Ark. ; m. twice: 1) Xantippe Glass in Clay Co., Ark. where she died August 5, 1886 at the age of 28. 2) Flora Belle Barnwell on February 27, 1887 in Malden, Dunklin County, Mo. She was born January 9, 1865 and died in Clay Co., Ark. November 11, 1927. He moved to Ills. and from there to Clay Co., Ark. Buried in the New Hope Cemetery, Pollard, Clay Co., Arkansas. 35 GEORGEANN (4) b. 1876 in Clay Co., Ark. ; d. there in 1910; m. John A. Permenter about 1895. 10 JESSE CALVIN (4) b. in August 1878 in Clay Co., Ark. 11 WILLIAM JACKSON (4) Born September 20, 1882. 36 LOU ELLA (4) b. April 10, 1886 in Clay County, Ark. ; m. William J. Nettles on Nov. 24, in 1904. He was 23, and she was 19. 37 JENNIE BELLE (4) b. November 27, 1887 in Clay Co, Ark; m. Thomas Russell on December 10, 1905 in Clay Co., Arkansas. Children: Dorothy b. 1806. Lloyd b. 1908. Leslie b. 1911. Ivan b. 1923. Emma Lou b. 1926. 38 SUSAN CLARK "Susie" (4) b. November 29, 1890; d. December 28, 1920; m. Joseph B. Whitehorn. 12 THOMAS ELMER (4) b. April 1895 in Clay Co., Ark. Joseph J. (3) William S. (2) John (1). b. December 27, 1882; d. 1958; m. Theadocia "Docia" Higdon, April 7, 1903. Dau. of Jefferson and Sarah Higdon. 39 NOLA JEROME (5) b. October 29, 1905; d. April 3, 1991 (SS Index - social security card issued in Michigan); m. Edith Mathilde Barslund June 30, 1929. She was born October 24, 1903. She was the Dau. Of Robert and Betty Jean. 40 MEDIA (5) b. November 7, 1911 in Clay County, Ark. ; m. Louis Gossett on September 6, 1930. She was born July 30, 1912. She died March, 1986 in Arkansas. Joseph J. (3) William S. (2) John (1). Born March 4, 1886; d. June 13, 1961 in Pigott, Ark. ; m. Sarah Ann Bell on December 28, 1911. 41 VEDA (5) b. December 2, 1911; d. September 1912. 42 FLOY (5) b. July 1915. Joseph J. (3) William S. (2) John (1). Born August 3, 1888; m. Dealy Thompson December 20, 1911. 43 ELVIS (5) November 28, 1909; d. November, 1969 (SS Index - social security card issued in Michigan). 45 ADELL (5) b. January 26, 1912; m. Lawrence Ott October 1930. 47 LUCILLE (5) b. April 16, 1926. Mary Jo Latta, 82, of Pollard passed away Thursday, Nov. 11, 2010, in the Flo and Phil Jones Hospice House in Jonesboro. She was born March 16, 1928, at McDougal and was the daughter of the late Clyde and Mary Emma Battles Conley. She was united in marriage to John Robert Latta on March 15, 1947. He preceded her in death on March 15, 1977. She was also preceded in death by one brother, Doylis Conley, and one sister, Norene Byrd. Survivors include her two sons, Johnny Latta and wife Linda of Paragould, and Steve Latta of Pollard; one daughter, Paige Wimberley and husband Rick of Wynne; six grandchildren, Dawn McGinnis, Todd Latta, Amy Morgan, Johnny Dale Latta, Michael Wimberley and Lindsey Wimberley; seven great-grandchildren, Ryan Latta, Bailey Burdin, Libby Burdin, Hunter Holland, Harley Latta, Bryant Brown and Charlie Latta; one brother, Clyde Conley Jr. of Piggott; many other relatives and friends. Burial was in New Hope Cemetery at Pollard. Pallbearers were: Todd Latta, Johnny D. Latta, Michael Wimberley, James Byrd, Randall McGinnis, Jason Morgan, Michael Howell and Ryan Latta. Thomas F. (3) William S. (2) John (1). Born Clay Co., Ark. August 26, 1878; m. Zora Sweet Langley, April 16, 1905, daughter of Andrew and Fanny Langley. She was born in 1883 and died in 1971 He was named Calvin after a friend. In 1916 postmaster at Piggott, Ark. In 1934 lived there. He is buried in the New Hope Cemetery, Clay Co, Ark. 48 THELMA VIOLET (5) b. April 10, 1908; m. Joseph F. Hyden in Stratford, Okla. August 1926. In 1934 lived at Pollard, Ark. Two children: Thomas Calvin b. September 7, 1927. Elizabeth Ann b. April 26, 1929. 49 MIRIAM (5) b. June 5, 1914. Single in 1934. 50 FRANCES MALONE (5) b. February 5, 1917. Single in 1935. Lived in Pollard, Ark. (Could this be the Frances "Patty" Latta who died on Sept. 6, 1999 in Corning, Arkansas). 51 ELIZABETH (5) b. about 1906. Twin with Jessie. 52 JESSIE (5) b. about 1906. 53 MARGARET (5) b. about 1915. 54 ELMER JACKSON (5) b. near Piggott, Ark. November 10, 1919; d. June 25, 1995 in North Little Rock, Arkansas (SS Index). William James (3) William S. (2) John (1). b. August 29, 1904; m. Della Glenn on April 14, 1940 in Clay Co., Arkansas. Charles Robert (4) Joseph J. (3) William S. (2) John (1). Born May 16, 1911; m. Julia Mead in May 1933. Lived in Detroit, Michigan. 56 DONALD (5) b. August 31, 1936; d. April 21, 1992. Finia (5) Charles Robert (4) Joseph J. (3) William S. (2) John (1). Born August 31, 1936 in Detroit, Michigan; d. April 21, 1992; ; m. (1) ____________; (2) Lynn Jewell in 1957. Don was a devoted and loving husband and father to his wife and children. Don served his country on the USS New Jersey. After leaving the Navy he held different lead maintenance jobs and retired from the United Postal Service. 57 ROBIN KAYE (7) b. ___________________; m. __________. Children: April. Lives in Detroit Michigan. 58 ROBIN (7) b. Nov. 4, ______; m. Robert Penoske. Children: Jason. Live in Muskego, Wisconsin. 59 ROBERT "Bob" (7) b. Nov. 13, ________; m. ___________. Children: April, Emily, Katie, and Erica. Bob is a structural Engineer. Live in Waukesha, Wisconsin. 60 RICHARD "Rick" (7) b. Nov. 9, _______; m. Wendy _______. Children: Ricky and Justin. Rick is a semi driver for United Parcel Service. Live in Vernon, Wisconsin. 61 RANDY (7) b. Oct. 13, ________. Works in the maintenance field. Lives in Milwaukee, Wisconsin. 62 RENEE (7) b. March 17, ______; m. Dennis Hartling. Later divorced. Children: Brian. Renee is a machine operator in a Waukeska factory. Lives in Sussex, Wisconsin. 63 ROXANN (7) b. July 6, ________; m. Brian Hudson. Children: Deidre, Kristi and Eric. Roxann is a paralegal major in the Milwaukee Area Technical College. They reside in Milwaukee, Wisconsin. 64 RAQUEL (7) b. March 18, ______; m. __________ Huppert. Children: son Christian. Raquel is a graduate from WCTC and is a computer programmer with MGIC. She lives in Waukesha, Wisconsin.